Since the housing bubble burst nearly seven years ago, the market has rebounded in a number of ways: Foreclosures have fallen to levels not seen since 2007. Home prices, housing starts and mortgage applications are up, while interest rates are down. Despite this encouraging news, however, many communities across America still face a shortage of quality, safe, and affordable housing. In fact, according to the Urban Institute, only one in four families that qualify for housing assistance actually get it. At the same time, our inventory of public housing and HUD-assisted properties shows that we have a capital needs backlog of nearly $26 billion for 1.2 million public housing units. Essentially, buildings are wearing out faster than we can replace them—shrinking our inventory by an average of 10,000 units annually through demolitions or dispositions. For families living in public housing, these numbers ultimately translate into reduced access to affordable housing and, in some cases, unsafe living conditions as a result of deteriorating infrastructure. HUD is investing in an innovative tool designed to preserve access to long-term and quality affordable housing. Called the Rental Assistance Demonstration (RAD), the program was created by Congress in 2012. For decades, HUD has allowed public housing agencies (PHAs) and owners of HUD-assisted properties to leverage private debt and equity to address capital needs. However, many times the sources and amounts of this funding are insufficient, leaving PHAs and HUD-assisted properties with substantial unmet needs. RAD allows HUD to test the conversion of public housing and other HUD-assisted properties to the same long-term, project-based Section 8 Housing Assistance Payment (HAP) contracts, providing them with the means to address those immediate and long-term capital needs. By allowing PHAs access to the same private financing already available to private owners of affordable housing units, RAD provides a level playing field for public housing agencies to make needed repairs and improvements. Under RAD, there are several safeguards that protect public housing residents. RAD requires PHAs to engage with residents both before and throughout the conversion process, and it allows all current residents to return to new or rehabilitated units. The program also offers residents the choice to move with a tenant-based voucher one to two years after conversion. All properties that convert under RAD also protect tenants in the event of foreclosure or bankruptcy. In sum, RAD protects public housing residents. The response from PHAs has been overwhelming. As of October 14, 2014, there are applications to convert more than 184,000 units to Section 8 project-based assistance under RAD. That’s 184,000 units that could make more than $3 billion in necessary capital improvements, secure more stable funding, and transform neighborhoods. The problem is that the RAD program is capped at 60,000 units, or roughly 5 percent of the nation’s public housing stock. In the 13 months since the program launched in 2012, we’ve already reached this statutory cap in applications. The popularity of RAD is reassuring, but without further authority from Congress to lift the cap of 60,000 units, we’ve had to place these applications on a waiting list. Therefore, we need the cap lifted. RAD’s first progress report—to be released this week—confirms the benefits of RAD. Prepared by Econometrica, it focuses on public housing conversions from a number of angles. The report describes the characteristics of the 57 public housing properties which have successfully converted as of August 2014. These properties which were approved for new Section 8 HAP contracts have raised $437 million in capital to improve the quality of housing for low-income households. The report also finds that the RAD applications approved to date propose to raise $19 in investment capital for every dollar of public housing funds used for development and construction. This would make RAD HUD’s most successful tool in terms of leveraging funds. Part of RAD’s early success is undoubtedly due to the flexibility given to PHAs to structure finances in a way best suited to meet capital needs of individual properties. PHAs can pursue debt-only transactions with conventional or FHA financing or use tax credit equity in their financing as well. In short, the report confirms what we already know about RAD—that with innovation and partnership we can come together to protect both residents and units. Lifting the RAD cap is not simply an expansion of the demonstration; it is an affirmation of our commitment to placing our public housing stock on a stable platform, ensuring access to safe and affordable housing to our most vulnerable populations. That’s why we need Congress to act—so that we can tackle America’s rental affordability crisis in public housing and continue our mission of creating strong, sustainable, and inclusive communities. 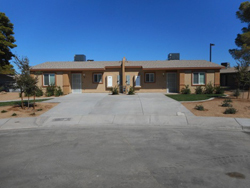 (Photo: Landsman Gardens RAD conversion in Southern Nevada, courtesy of the U.S. Department of Housing and Urban Development). Jemine Byron is the Acting Assistant Secretary for Public and Indian Housing at the U.S. Department of Housing and Urban Development and Biniam Gebre is the General Deputy Assistant Secretary for Housing at the U.S. Department of Housing and Urban Development.